No trip to NYC would be complete without a Bagel Schmear. When I was a kid growing up in the Bronx, my Dad would take me to what he called “The Bagel Factory” early on Saturday mornings. I was too young to remember where exactly it was, but I do recall the noise of the ‘elevated’ train up above. And yeah, the taste of those bagels. Killer. Fresh, soft and hot. Mmmm. So of course we had to find a bagel shop for Leslie. Here is Murray’s on Sixth Avenue. And it’s nice to report that there was one guy on Wall Street with some soul. More than ten years ago, when he was putting in long hours as a Vice President at Merrill Lynch, Adam Pomerantz had a dream. A dream of someday running his own business – not a business on Wall Street, but something much closer to his heart, and his stomach. He followed his heart and his stomach, and when it was right he just knew it. 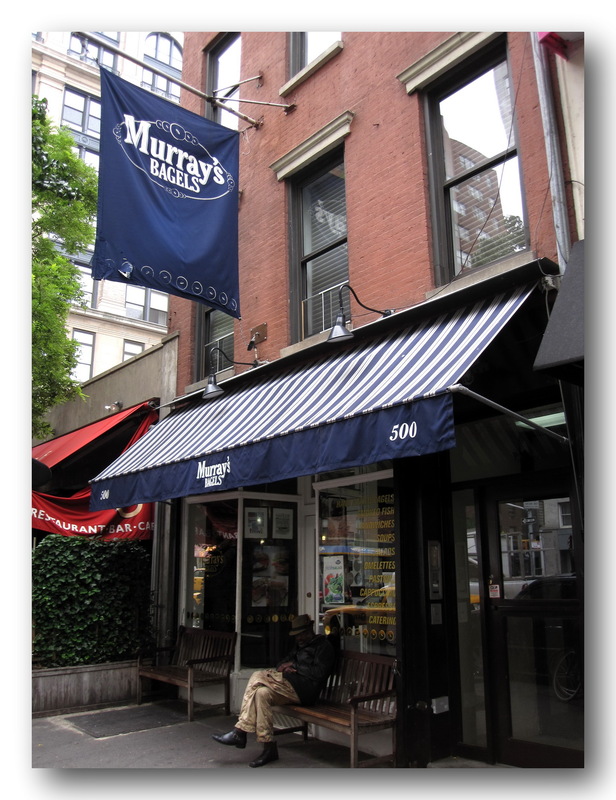 He found a small storefront in Greenwich Village, which he renovated on a shoestring budget, opening Murray’s Bagels in November 1996. 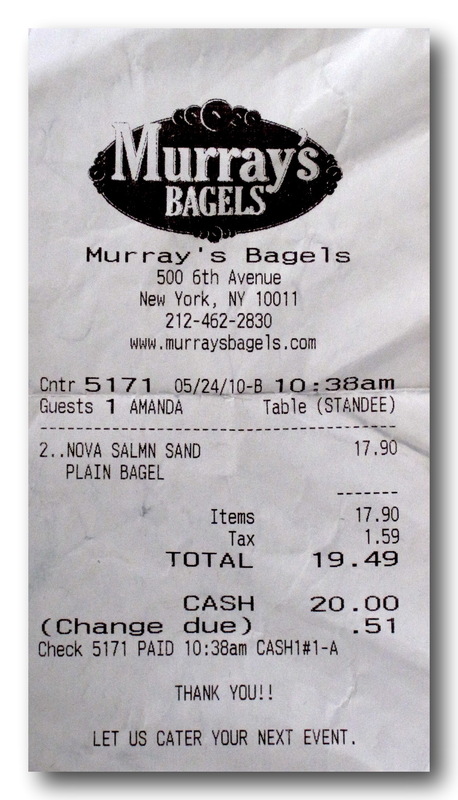 Adam named Murray’s Bagels for his father, from whom he learned his love of bagels and appetizing. And here’s a Schmear you can believe in. Just to prove that Murray’s retains some of it’s Wall Street Heritage, here’s the tab. 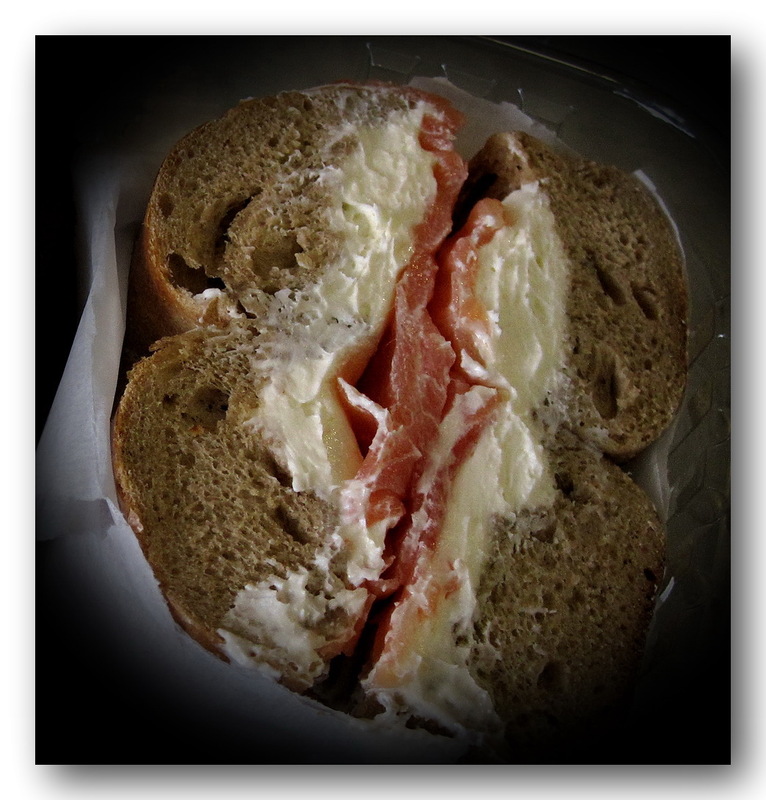 Two bagels, with Lox, and Schmear. Total price, just shy of $20.00. It’s a good thing my Dad isn’t still alive, because this bill would put him in his grave. Along with the “Big Mac Index” do we also need the bagel index? Twenty bucks! And that didn’t even include coffee …. manischewitz, who can afford to live there. Is it no wonder the Wall Street guys steal our money …… they are trying to keep themselves in bagels. Is it trickle down thievery or trickle up? All is not lost. I understand that the Dems will take up bagel regulation after the summer recess. Problem is that the Repoobs in the Senate won’t go along, and are threatening to bagel-buster the legislation and not allow a floor vote. I say, give the American People a simple ‘up or down’ vote, or we will cast a Lox on Your House.